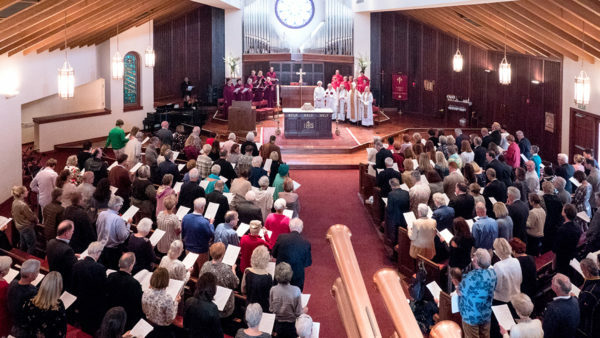 [Episcopal News Service] An Episcopal congregation in Southern California that had been barred from its church for three years amid a property dispute with the diocese has returned to the church with a spirit of reconciliation and hope. Families are inundating the church with requests for baptisms and weddings, the congregation is ramping up its outreach ministries, and on April 8 worship services resumed at the Newport Beach church for the first time since 2015. What was St. James the Great is now known simply as St. James Episcopal Church. She got the keys to the church a couple weeks ago to inspect the structure for any maintenance requirements. Then last week, in preparation for the Eucharist on April 8, 25 to 40 volunteers showed up for five straight days to help clean the church, washing windows, vacuuming floors, scrubbing bathrooms. Voorhees and her staff are still working to get phone, internet and other services fully restored. Diocese of Los Angeles Bishop John Taylor preached the sermon. 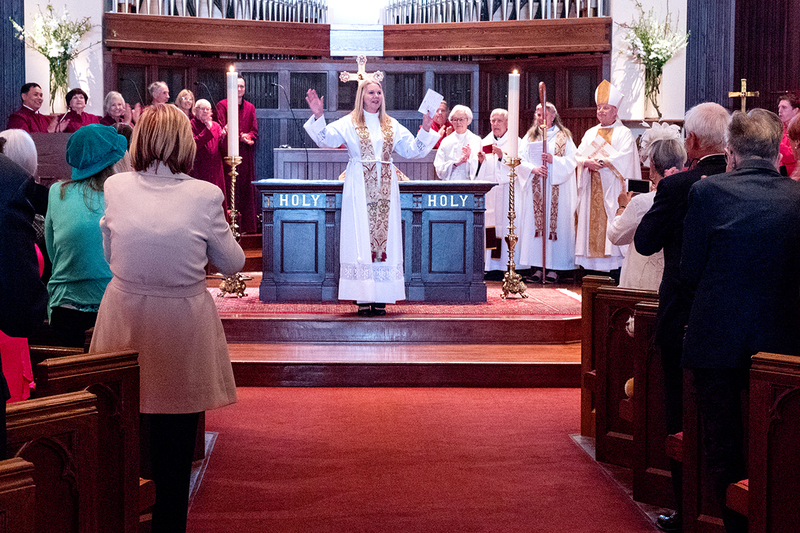 His episcopacy paved the way for the congregation to return to the church. He addressed the property dispute in the sermon, saying negotiations made it hard for him and other church leaders to fulfill their roles as pastors. “We are reclaiming our pastorship this morning,” Taylor said, drawing a parallel between Jesus’ resurrection and the congregation. He repeatedly invoked a theme of reconciliation. The property had been at the heart of disciplinary proceedings last year against Taylor’s predecessor, Bishop J. Jon Bruno, for his attempts to sell the church building. Members of St. James the Great had been forced to worship in a Newport Beach Civic Center community room while the property remained in dispute. The disciplinary hearing panel found Bruno guilty of the St. James complainants’ allegations and said he should be suspended from ordained ministry for three years because of misconduct. 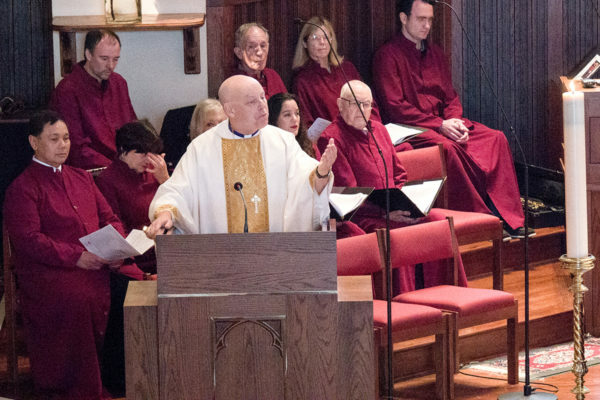 Bruno retired at the end of November, and Taylor took over as diocesan bishop on Dec. 1. In November, the Diocese of Los Angeles released a statement outlining a plan for future use of the church property, including the eventual resumption of worship services there by the congregation. The diocese plans to use part of the facility for its Redeemer Center for Diocesan Ministries. The diocese also committed to helping St. James regain mission status. For now, it is a mission station with Voorhees as bishop’s chaplain. She hopes the diocesan convention in December will consider granting mission status. Until then, St. James has plenty to do. Although it had continued to pursue outreach ministries while worshipping at the Civic Center, it now will be able to resume after-school programs and step up other initiatives serving children in the area. And Voorhees said the church has a backlog of baptisms to schedule – her own 2-year-old granddaughter among them. Not many families wanted to hold baptisms in the Civic Center, so they waited and hoped. St. James also is fielding a sudden barrage of calls about weddings. It is located next to a boutique hotel, which makes it something of a destination for engaged couples planning their ceremonies and receptions, Voorhees said. This is a big change from just a couple weeks ago, when the congregation was forced to find a temporary place of worship for Good Friday and chose to join with a local Baptist church, and it celebrated Easter with a Eucharist at the Civic Center. Things are starting to return to normal, though Voorhees said her congregation remains committed to reconciliation work with the diocese. “There’s rebuilding that has to go on, and I think that everyone is willing and wanting to do that,” she said. Very good news, and overall good article! But I was startled to read in the penultimate paragraph that the congregation was “FORCED to join with a local Baptist Church to worship Good Friday.” (Emphasis added.) What an insulting thing to say about those Baptists who welcomed our folks to join with them! Yes, it may have been disappointing not to follow our BCP rite for Good Friday, but could there not be a better way of putting this. Ecumenical cooperation is a blessing, not a curse. You are correct, Frank. That was not an accurate depiction, due to imprecise language, not from any intention to insult. The church was forced to find a place to worship and CHOSE to worship with the Baptist congregation. I made that adjustment in the story. Thanks for pointing it out. I couldn’t agree more with Mr. Corbishley in his sentiments, but suspect that it was simply a poor choice of words. Great news for all of us who’ve been following this story. A real Resurrection tale. I’m hopeful the author didn’t mean anything by “forced.” Here in La Grande, Oregon, in the Diocese of Eastern Oregon, we participate in regular joint services (including Good Friday and Epiphany) with four other ‘mainline’ denominations! We are all one in Christ, after all. Congratulations to the people of St. James! God bless your ministry. That is a good point, Kathryn. The church was forced to find a place to worship and CHOSE to worship with the Baptist congregation. I made that adjustment in the story. Thanks. I am pleased and relieved to see justice done. I am sad for the tribulations and trials they had to go through. Reconciliation is such a wonderful thing. Refreshing to read of such positive developments in the Church. Don’t know a soul involved there but it makes me so happy to see this protracted conflict resolved. Alleluia! Christ is Risen. The Lord is Risen Indeed. Yes it is nice to finally get to reconciliation, but if memory serves me there is a whole other original congregation that had been in St. James since the days when she was planted. Some three hundred people including the priest. They were forced out, and were not ever part of this congregation. But I have always heard wonderful things about this new priest, I would not be surprised if she hadn’t already tried to reconcile with them. I am so happy to hear this news. I have been following the story for years (including the split) with a heavy heart. I grew up in this church, sang in the Cherub and Junior Girls’ choirs back in the 1950’s. St. James will always have a special place in my heart. We will be visiting the next time I am in Newport Beach.